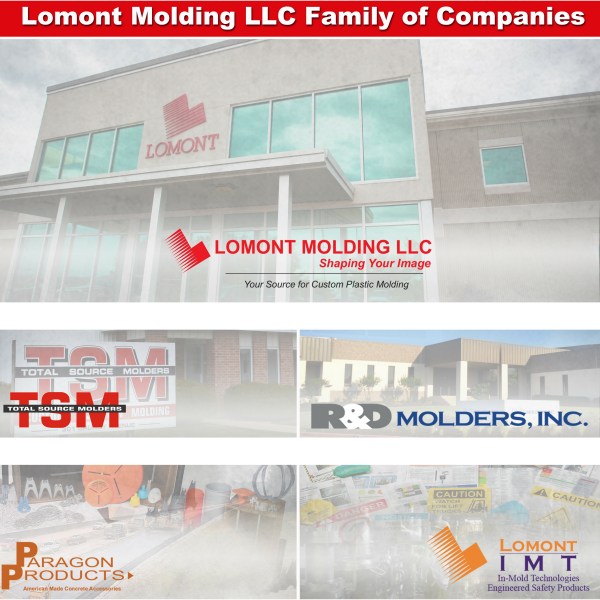 Lomont Molding LLC’s family of companies work in conjunction to make sure we provide our customers with excellent customer service and quality products. Our family of companies includes: Paragon Products (Paragon), Lomont In-Mold Technologies (IMT), Total Source Molders (TSM), and R&D Molders, Inc. (R&D). Paragon, a product of Lomont Molding LLC, specializes in American-made rebar and concrete accessories. Paragon produces parts that are used in the commercial highway, pre-cast construction markets, and concrete test labs. Lomont IMT, a product of Lomont Molding LLC, features the next generation of safety signage and identification products that is revolutionizing the safety marking industry. In-Mold technology utilizes robotics and a patented method that capitalizes on the advanced properties of plastic materials in the molding process. TSM, located in Reinbeck, Iowa, is an plastic molding manufacturer. Since 1975, TSM has been offering custom injection molding services. Specializing in agricultural and construction markets, they have been able to offer ISO certified services to a wide spectrum of Midwestern industries. R&D, located in Georgetown, TX, has been providing custom blow molding, injection molding, tooling, and associated secondary services to a variety of customers for over 40 years. R&D has successfully solved solutions for the Medical, Industrial, Consumer Goods, Sporting Goods, Electronics, GSA/DOD, Home and Garden, and Energy industries.